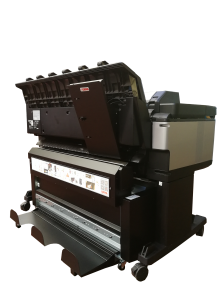 GeraFold 300 is a new A0 paper folder machine designed to provide a compact solution for all HP DesignJet series t 3500 T2530 T2500, T1500 T1530, T920, T930 printers. With an affordable investment the automatic A0 fold machine allows to manage internally the finishing process precisely and instantly, with the result of immediate cost reduction by eliminating the hard and expensive operations of trimming and manual folding of the documents. In a simple click your wide A0 documents will be ready to be distributed and you will be able to respond efficiently to work peaks without the need to employ high level personnel in manual and time consuming activities or be obliged to subcontract the folding activity to external service firms and put in danger the confidentiality of the projects or compromise the schedule. The first fold is obtained automatically with dimension 210mm, 190mm or 8.5″ and 9″ while the second cross fold is obtained through a guided introduction of the document with first fold done. This Wide Format Folder for CAD and GIS drawings is able to provide copies folded into A4 with high precision while plotter is printing. The folding machine has been designed to handle colour or black & white documents folded in different package dimension, is supporting document very long with the unlimited length capability and wide up to A0+ 36″. Easy to be used and installed, silent, perfect for any technical department environment. Fill the form below and we can help you choosing the A0 fold machine that fits your needs, or to give your more informations about our local reseller.